Is there a better MacGyver image than his radio build at the beginning of the episode? I think not. Here is an image. Could you actually build a radio from a snow mobile? I think yes. Really, radios aren’t actually that complicated. The only difficult part would be building an amplifier so that the signal generated from a voice is powerful enough to be detected by someone’s radio. If the snow mobile had any kind of radio (like for listening), you would have all the parts you would need. They call these hand held zap things stun guns, but they don’t shoot. You just have to hold them up to someone to shock them. MacGyver needs a distraction so he takes the stun gun and uses it on a slot machine. After that, the guy playing wins. Is this even possible? Possible, yes. Likely, no. The stun gun has high voltage that creates sparks. These sparks can damage electronic equipment—especially the super tiny transistors in a computer chip. So, it’s possible that the stun gun does something to cause a win. However, these slot machines are built with tampering in mind. They need to be able to resist humans messing around with them to win. So, I doubt this would work. Also, if MacGyver zaps that outside of the machine it’s probably grounded. This means that the electric current that gets into the case of the slot machine will just go around all the electrical components. You probably have a better chance of winning on the slot machine than cheating on it. In order to get through an iris scanner on a door, Jack gets a close up picture of the target’s eye. Then Bozer prints out a fake lens to wear over the eye. Could this work? It’s possible. In fact, check this out. Someone did the same thing with the Samsung Galaxy S8. A cellphone stingray is a device that acts like a cell tower. Cell phones connect to it thinking that it’s just a tower—but blam, it’s actually another computer. Of course the details are complicated (which means I don’t really understand them), but you would need some type of antenna. Jack has a tiny antenna in his cuff that has to get close enough to the target’s phone. I think this is plausible. At least it would give Riley a chance to get into the phone and steal some codes. Also known as a compass. MacGyver is trying to find a magnetic switch for a hidden door. He grabs a bit of metal (hopefully it’s ferromagnetic steel) along with a magnetic bottle opener. The basic idea is that a metal like steel (most steel) has magnetic domains. When these domains are lined up, the material will act like a magnet. You can line up the domains by rubbing the steel with a magnet. Like this. If the magnetized steel can float, it will rotate and point in the direction of an external magnetic field—either from the Earth or from that magnetic door switch. OK, one small issue. In the episode it shows MacGyver rubbing the steel back and forth. You really just want to rub it one way. I think it would still work though. Oh, also many of those magnets like the one on the bottle opener have weird domains. They aren’t just like a plain north and south of a bar magnet, but it still might work. This is awesome (and mostly real). Here’s how it works. The vacuum cleaner works by pulling air out of a region. If you put a vacuum cleaner over carpet, the air flow goes from the carpet to the vacuum cleaner (basically with just a super powerful fan). When the air moves in this manner, it often picks up other stuff—like dirt. MacGyver has this vacuum hooked up to some metal tray covers. When the air is pulled from these covers, the air pressure inside the covers decreases. That means that the external pressure (due to the Earth’s atmosphere) will push the covers onto the glass wall. The types of materials interacting. The magnitude of the force that pushes these two surfaces together. If you push two surfaces together really hard, there will be a greater frictional force. So, this force from the vacuum cleaner exerts a force that increases the frictional force and this frictional force allows MacGyver to climb like Spider-Man. Here is something similar with a guy that hangs from an overhang with a vacuum cleaner. Pretty cool. This is real (based on something real). Yes, you can actually make metal things smaller. Here is a great video from Physics Girl (Dianna Cowern) that shows how this works. The basic idea is to create a HUGE electric current very quickly. This large change in current can create a very high change in magnetic fields. When you put metal in this high changing magnetic field, it induces an electric current in the object. This induced current creates a magnetic field that interacts with the external magnetic field in such a way that the device gets squished. It’s awesome. Oh, when I say “a large change in magnetic field”, I am actually talking about the time derivative of the magnetic flux. So, what do you need to make this coin shrink thing work? You just need super high current super fast. The best way to do this is to charge up some big capacitors and then discharge them through some wires. That’s essentially what MacGyver does. The biggest problem is his capacitor. He builds one using two roulette wheels. Like this. Yes. Any two metal devices can create a capacitor—but you want one with a large surface area and very close together. If you turned the two tables around so the flat side was close to the other one, it would be better—but it’s still a capacitor (but not really big enough for this job). Still, the idea is solid. I’m kicking myself. I should have been writing these MacGyver notes for each episode as they aired on TV. But no. I had to make things more complicated. Well, here I am—starting the notes for season 2. Let’s just jump in. Note: there’s some pretty good stuff in this one. MacGyver takes a button from his shirt and breaks it in half. From this half button he sharpens the edge so that it can cut through a rope. I wouldn’t normally include this one in the blog since there’s not much science to talk about—but I’m just excited. MacGyver takes a metal rod and puts it in an empty dip stick tube from an engine. He adds the powder from a road flare to act as a propellant. This would then launch the improvised harpoon forward. Once the harpoon is stuck into a fleeing car, Mac wraps the cable around the horizontal axle on the sidecar to a motorcycle. As the axle spins, the cable wraps around it and pulls the motorcycle closer to the car. Mini gun as a starter motor. They need a car. MacGyver finds one—but it’s missing a starter motor. Really, there is nothing super special about a starter motor. It’s just a DC motor that is strong enough to turn over the engine so that it can turn itself (using gasoline). The mini gun also uses an electric motor. In this case, the motor spins a combination of gun barrels so that the fire rate can be higher than a normal machine gun. Could you use one motor for another application? Theoretically, yes. The only tough part might be mounting the motor (which MacGyver does with some wire—wire is often better than duck tape). The other problem is making sure the gears on the motor match up with the gears on the car to turn over the motor—but it’s still possible. Sometimes, there are hacks that look too crazy to be true—but in fact would totally work. Here is an example of such a hack. MacGyver and friends take a long pole. MacGyver gets on one end near a wall and the other two push the pole towards the wall. This allows MacGyver to walk up the wall. But wait! Here is a video of this trick being used in real life by a Vietnamese SWAT team. Here is my super short explanation. 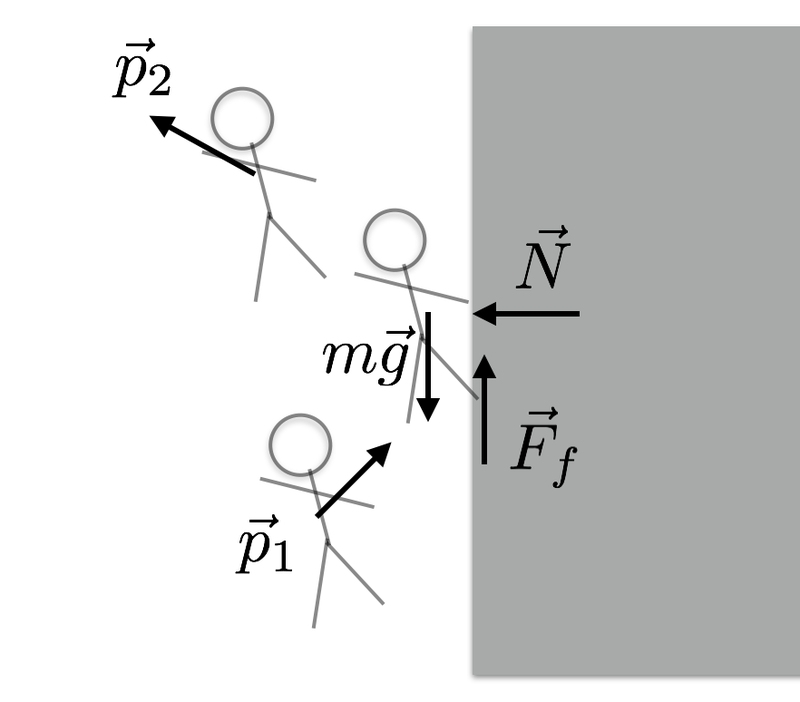 If you push someone against a vertical wall, there will be a frictional force pushing UP. 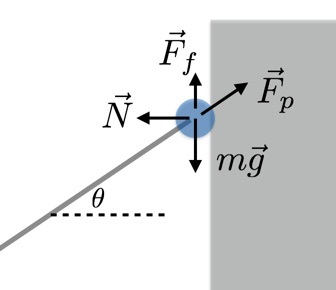 If the push is great enough, this upward frictional force can be equal to the gravitational force. Boom. That means a person can walk up a wall. Here is a force diagram of that situation. Oh, I also made a video to show you how this works. Finally, here is a more detailed explanation from my WIRED blog. Cell phone in a soccer ball. Ok, you can put a camera in a ball and kick it through a window. Not really much of a hack, but clever. Some type of air supply with a regulator. A mask and some type of mouthpiece to breath. Please forgive me, but I’m going to go over more detail in this case that you would like. I can’t help it. MacGyver is basically cave diving—this is something that I used to do quite a bit. Just to show you what that was like, here is an older picture of me. It’s not cave diving, but it’s using all of the same gear (it was practice). Let’s start with the scuba gear. MacGyver doesn’t have a regular scuba tank, so he uses an oxygen tank used for welding. You don’t normally want to use oxygen for scuba—you want to use air (which is only 21% oxygen). You see, oxygen is actually toxic. If you breath oxygen at high pressure, it can do bad stuff to you. Fortunately, MacGyver is going to use this at very shallow depths—he should be fine. Also, he won’t need to much gas as you consume much more at greater depths (for open circuit systems like scuba). What is a regulator? Suppose you have a pressurized tank at 1000 psi. You can’t really breath air (or any gas) at that pressure (although there are some tricks—ask me later and I can tell you about this). That’s where the regulator comes in. It takes pressure from the tank and reduces it to the ambient pressure. That’s really important. It has to deliver the pressure at the same pressure around the human. If it was too low, you wouldn’t be able to expand your lungs and breath. Luckily, they have regulators for welding stuff too. You need a second regulator to let air out only when you breath—but it’s possible to build one of these (they are much simpler). Now for the DPV. These things are very useful in cave diving. How are you supposed to get 5,000 feet back in a cave if you have to swim the whole way? The early DPV (or scooters as we called them) were essentially trolling motors from a bass fishing boat connected to a battery. Just about any electric motor with a battery could work. Ideally, the motor should be sealed so it can run underwater—but it doesn’t have to be perfect. It only has to work for a short time. I really like the scooter in the episode. It really looks like a home built scooter. OK, you can’t see it too well in that image—just trust me. Or better yet, watch the episode. I also like how MacGyver side mounts his tank. Even if you have done normal scuba diving, you might be surprised at how these tanks behave underwater. Just because they are heavy out of water doesn’t mean they will pull you down underwater. Very often we would bring extra tanks (stage bottles) in a cave and carry them on our side just like MacGyver did. MacGyver gets to run up a wall twice in this episode. Just like the wall run with the pole, this case also uses friction. It’s your classic parkour wall run-jump. If you run towards a wall and push yourself back, there is a force between you and the wall. The faster you run, the greater the force. If this force is great enough, there will be a large enough upward frictional force so that you can get an extra upward jump. That’s exactly what MacGyver does to get out of the tunnel. Here is a more detailed WIRED post on this wall jump. Simple enough – right? There are two forces on the book. A contact force (the table pushing up) and a long range force (the gravitational force of the Earth pulling down on the book). These two forces have the same magnitude, so when added together, they give a total of zero vector. This means the book is in equilibrium. If the book is still in equilibrium, then the force of the table on the book (due to friction) would have to have the same magnitude as me pushing on the book. Note: Even though my push and friction are equal and opposite, these are not Newton’s third law force pairs – I talked about that in the free-body-diagram post. Physics of Linerider IV: Friction? This is the x-position vs. time for the line rider on the first horizontal portion of the track (before he or she goes down the incline). This shows the rider traveling at a constant speed of 0.71 m/s. If friction were present, the rider would slow down. If you do not believe me (and why should you?) try creating your own line rider track with a long horizontal section. The rider will not stop, but continue on at a constant speed. Ok, so no friction on the horizontal line. This makes a little bit of gaming sense. Who would want a rider to stop in the middle of the track and be stuck? That wouldn’t be fun. But, is there friction on non-horizontal portions? To test this, I will use the work-energy principle.